In 1959, Faerie came for a little changeling girl named October Daye and presented her with the Choice that her mother had been struggling to prevent her from ever needing to make. But how did Faerie find her? Where did the channel of October's destiny diverge? To know the answer, you must look to the water, and to the woman who many refer to as "the sea witch." It can be hard to deal with betrayal. Betrayal by family is so very much worse. *Included at the end of Chimes at Midnight. 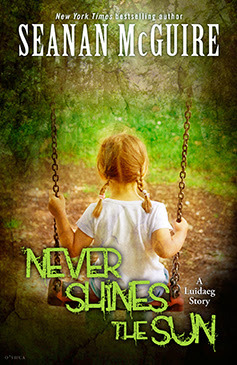 Never Shines the Sun is a short story that was included in my edition of Chimes at Midnight. I'm not sure if all copies of the book include it or just the DAW Books mass market paperback so it's worth checking before you purchase. The story told from the Luidaeg's point of view and as I'm a huge fan of her character this was a really exciting one for me. It gives us a lot more insight into the Luidaeg's relationship with Toby's mother Amandine and raises a whole heap of questions about what Amandine was hoping to achieve by changing Toby's blood when she was a child. It also drops hints about how important Toby is in the grand scheme of things and just why the Luidaeg has been so interested in her since they met.